Undoubtedly, chocolate tastes wonderful, but what stands behind this outstanding snack? 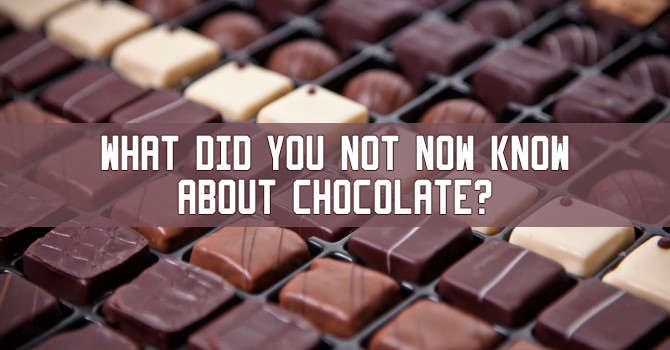 Below you are going to find 10 interesting facts about chocolate. “Death by chocolate” – sounds ridiculous? How about one occasion in Mexico in the 17th century? Well…it wasn’t actually chocolate, it was a poison injected into it. It happened with Spanish Bishop who wasn’t able to resist the temptation to taste a piece of great chocolate during his church service. Good reason to beware of what you eat isn’t it? Another interesting fact about chocolate is that it literally makes us happy. Chemicals which are called tryptophans influence the level of endorphins in our brains and increase the level of serotonin production which leads to stance similar to euphoria. Ancient Aztecs and Mayans believed that chocolate was the food of the gods. Their kings were drinking warm chocolate on the regular basis and their citizens would rather have a pack of cacao beans in their pockets than a sack of gold. This might sound awkward as soon as we now that sugar or artificial sweetener isn’t good for our teeth. However, natural chemicals chocolate consists of can prevent tooth decay. Moreover, it is so effective, that even might be added to the toothpaste or mouthwashes, of course in small quantities. The amount of chocolate Americans consume is close to the number of three billion pounds, which is almost 50% of all worlds’ chocolate. Impressive, isn’t it? Chocolate contains a chemical which releases “pleasure” endorphins in our brain. It is called phenylethylamine and it literally makes people feel ‘love’. Around 20% of worldwide peanut crops and 40% of all almonds grown in the world are used by chocolate makers. Once, Percy Spence, who was a big fan of chocolate after spending some time near the Magnetron, discovered that a chocolate bar he kept in his pocket has turned into a mass. After that, he quickly realised that magnetron could be used to heat up different food. That’s how Microwave oven was born. Think you can cheat by eating a lot of Sugar-Free chocolate and save calories? I’d recommend forgetting about it if you don’t want to spend the rest of the day on a throne. Seriously, don’t eat too much sugar reduced chocolate.